Whilst staying at Villa Serendipity we visited the ancient city of Messene, situated in a beautiful, fertile valley below the modern village of Mavromati. It was a lovely car journey, which took approx. 1 and 1/2 hours giving us the chance to enjoy the thought provoking rustic scenery consisting of rich olive groves, coastal views and, as we approached our destination a sparser more mysterious landscape. I love to travel through the villages and towns, and always feel privileged to have an insight into how differently other people live their daily lives. Messene itself isn’t fantastically sign – posted, so a sat nav would be beneficial, but don’t let this put you off – its well worth the journey. Ancient Messene is a major historical and archaeological site located in the Peloponnese region of Greece. So, lets be frank here. When I mention a visit to a site of Greek ruins, the less history enthusiastic among us may not be very tempted (stop rolling your eyes!) But, hold on ! This site is really worth the visit. The site is vast, totally unspoilt and uncommercialized, set in a magnificent timeless landscape. The city of Ancient Messene was founded in 369 BC by the Theban general Epaminondas. The walls constructed at this time then protected the settlement for nearly 500 years. Excavation of Ancient Messene started in 1828, and since then there have been some carefully undertaken reconstructions. To the visitor, it provides an unique insight into how life would have been. Among the highlights for us were the Theatre, Agora and Stadium. The sheer size, detail and beauty really captured the children’s imaginations. There are plenty of multi lingual information boards around the site so we were able to confidently answer all their questions and educate ourselves too. The children absolutely loved exploring the stadium, it’s such an awe – inspiring place and it is literally possible to imagine yourselves there amongst the gladiators and the cheering crowds. You can almost feel the adrenaline, the excitement and the fear. This coupled with the reassuring peace and tranquillity that surrounds the site today makes for a feast for ones imagination. We were there in April – it was pleasantly warm, we were comfortable in shorts and long sleeved shirts. In order to enjoy all that is on offer, there is a fair amount of walking on mostly rough terrain so sensible shoes, sun hats and water would be advisable. I imagine it gets very hot in the summer months. There are toilets and free spring water available on site . There is a small café on site ( not open when we visited ) and a museum situated in the village. On hindsight, I think taking a picnic would have been a really lovely idea, and I would certainly recommend doing so. On departing the site we stopped at a restaurant we had earmarked on our way there, called Pyles. As it was out of season it was fairly deserted, however a very kind lady came over and spoke to us. 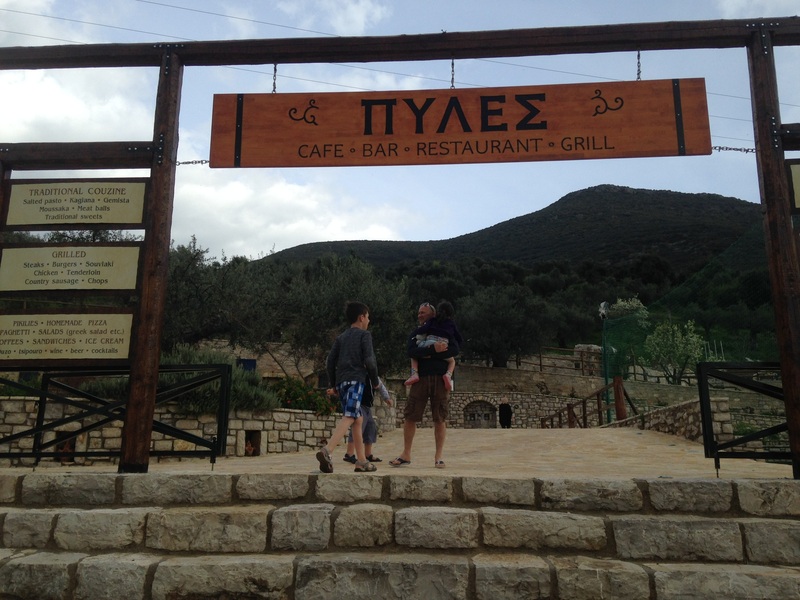 Well, her English wasn’t much better than our Greek but we did manage to establish that we were hoping to get a meal and she explained they weren’t yet open for the season. However, they made us more than welcome and went to a huge effort to make us a meal regardless. I imagine , in season, its a wonderful vibrant place to frequent. The food was excellent home cooked Greek cuisine.